It was like that moment when the Wizard of Oz’s gigantic green face appears in front of Dorothy. Only it was my gigantic face. And there were two of them, on either side of me. And in front of me wasn’t quaking Dorothy, but 1200 children’s book writers and illustrators poised to hear what I had to say about “The Up-to-the-Minute State of the Industry.” It would’ve been so easy to freak out about those facts, but instead, standing there in front of everyone, I was consciously struck by what a privilege it was to be entrusted with this responsibility. 17 industry insiders had shared with me their opinions and insights about children’s book publishing and its marketplace and its readers, and SCBWI had trusted me to synthesize that input into a snapshot for attendees of the 2013 SCBWI Summer Conference in a keynote speech last night. I took that to heart and did my darnedest to help my fellow children’s book creators to have a rich understanding of where we’re at and a sense of what we can look forward to. The response from the audience then and at the pool gala afterward was gratifying. Today, I woke up to read the SCBWI conference blog calling my keynote “a fascinating, unique and remarkably valuable talk to better understand the business side of our industry and where our work might fit. She’s helping us do our homework, and do it well.” Phew! I also found this photo of my gigantic green faces. Yowza! Seriously, folks, look at tiny me at the podium and then look over both of my shoulders. Now I can freak out. 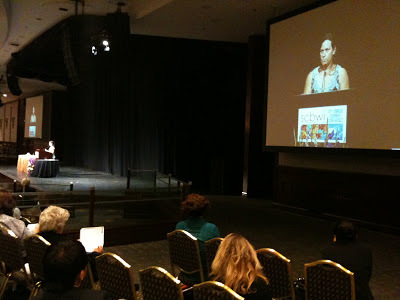 Wish I could have been there in person, but I am so grateful that the SCBWI has a blog to follow. Great job, Deborah! You rocked it! Proud of you! Knew my daughter was destined for success.